A year ago, I joined the new Cyber Chapter, Virtual Threads. As per my usual, I signed up for too many projects for the available time I had. One of those items was the UFO challenge. We were to write down which UFOs we wanted to finish in 2014 and provide pictures of the unfinished items. When the piece was finished, a picture was to be posted into the completed UFOs album. I registered 7 pieces and finally, after 5 complete months, I can report that I finished one of my registered UFOs. At Seminar 2013, I took Carolyn Mitchell's "Off the Beaten Path", a wonderful canvaswork design in 3 pieces. Yes, I finally finished it! Carolyn told us that "Off the Beaten Path" started out as "Under the Boardwalk", and that's how I finished mine. 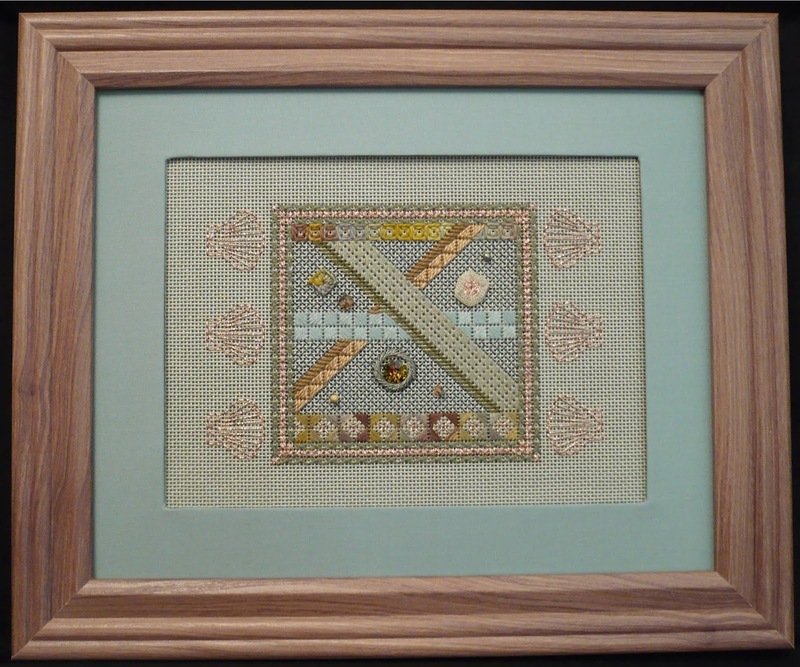 For the smallest of the 3 pieces, I stitched in seashells and framed it differently from the other 2 pieces. I am thrilled with the way it turned out and I had to share the pictures. I also signed up for a Secret Stitcher friend. We were assigned a name from those who wanted to participate and once a month, a gift or message was to go to that person. I have finished my June gift already and it goes in the mail in the next day or so. The Secret Stitcher friend who has my name surprised me at Seminar. She gave me my birthday present really early, as my birthday is in November. Imagine my surprise, when I walked into my room one day and the gift was on the table. Inside were Nanaimo Bars (my favourite) and a fantasy novel by Neil Gaiman (which I loved). I had never read him before and have added a new name to my list of favourite fantasy authors. Thank you again to my Secret Stitcher friend. 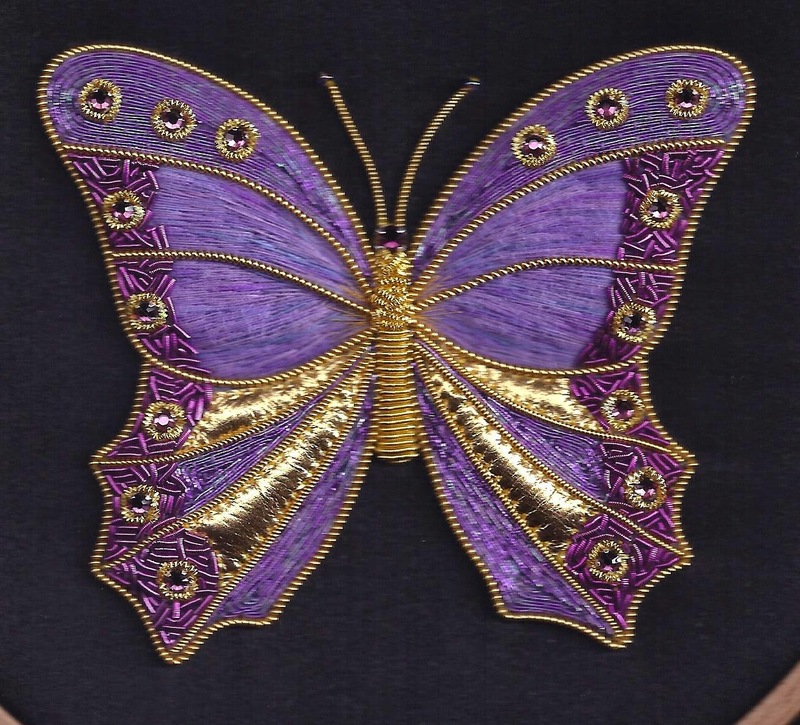 In my last blog, I mentioned that I was working on the Lavender Sparkle Butterfly course designed by Alison Cole for Virtual Threads. I finished it (my husband says he thinks it's the second best piece I've ever done. The best was a Goldwork Dragon I designed) and I'm sharing the picture with you. 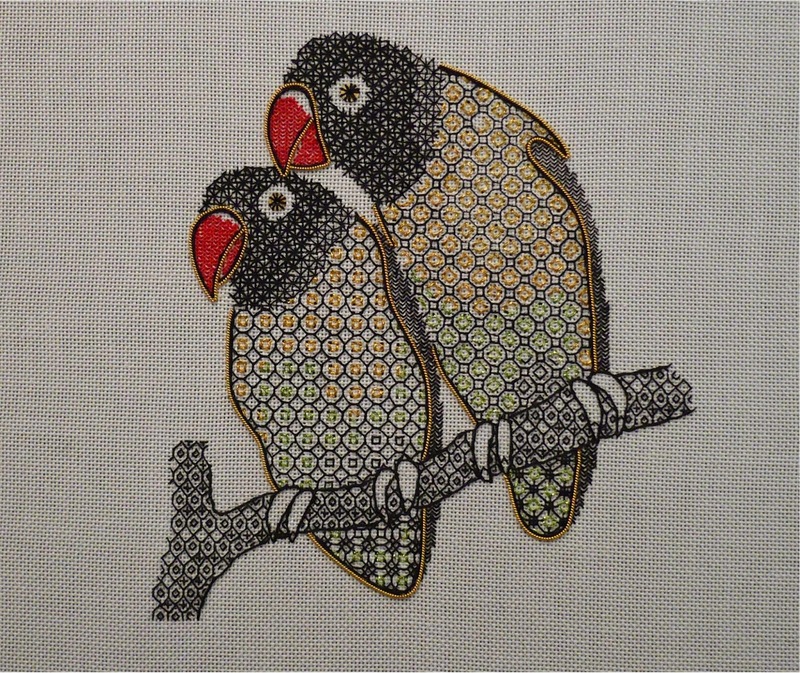 I have also finished one of my pieces from Seminar 2014, Tanja Berlin's "Love Birds". I really enjoy blackwork and Tanja's designs are so delightful that it's hard to stop until it's all completed. 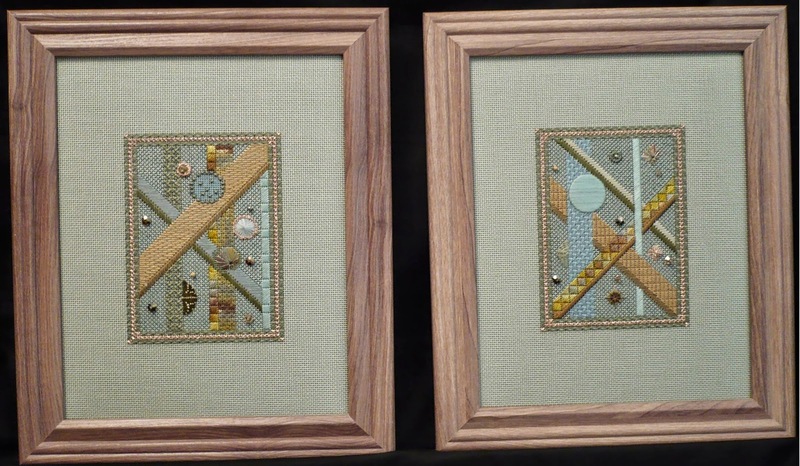 Just fabulous stitching on all 3 pieces. Congratulations on your superb finishes!